Do Christian Homeschoolers "Embrace" Evolution? I read this article and wanted to share it with you: Do Christian Homeschoolers "Embrace" Evolution? 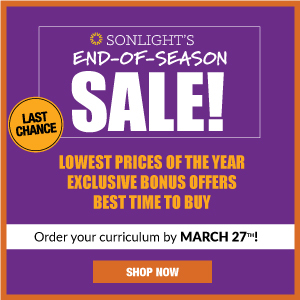 https://blog.sonlight.com/do-christian-homeschoolers-embrace-evolution.html. A recent article in The Atlantic featured this headline: "Old Earth, Young Minds: Evangelical Homeschoolers Embrace Evolution." It then went on to offer anecdotal evidence indicating, "More Christian parents are asking for mainstream science in their children's curricula." According to the article, the vast majority of Christian educational materials on science and evolution favor young-earth creationism--the view that God specially created the earth thousands of years ago. "[E]vangelical families who embrace modern science are becoming more vocal about it," reads the article, suggesting that modern science is about evolution, not young or even old-earth creationism. 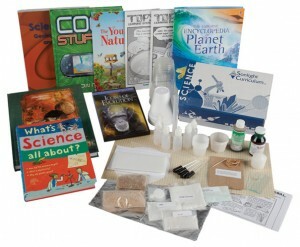 Today's homeschool science textbooks, says the article, reject "modern science." This is not a new debate. Science and faith are often portrayed in the media as being incompatible. We're told that science emphasizes reason, facts, and evidence, while faith is blind, solely about emotion, and has no basis in evidence. This, of course, is far from the truth. Not only are some scientists biased in the defense of their underlying worldview--naturalism--but many Christians find their faith to be "true and reasonable" (Acts 26:25, NIV) on the basis of an abundance of evidence. 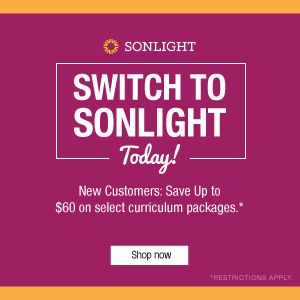 Five years ago I participated in a revision of Sonlight's K-6 science curricula (what we call Science A, B, C, D, E, F, and G). In our introduction to these science levels, we summarize four broad options: non-theistic evolution (naturalism), theistic evolution, young-earth creationism, and old-earth creationism. Obviously, Christians reject non-theistic evolution because by definition that view excludes the supernatural and, with it, God. But what about the other options? Young-earth creationism is promoted by organizations such as Answers in Genesis, old-earth creationism is held by Reasons to Believe, while theistic evolution is the view of Biologos. In addition, the Discovery Institute promotes what it calls Intelligent Design, which claims to remain neutral on the question of old versus young earth, but opposes theistic evolution and non-theistic evolution. My goal here is not to definitively settle the questions surrounding science, faith, and evolution. I know better than to think I can resolve these significant questions in one blog post! I do wonder, however, what you think of these questions. Is it true that Christian homeschoolers are embracing theistic evolution? (This is the view that God plays a role in the evolutionary process.) Do you teach young-earth creationism? Old-earth creationism? Intelligent Design? How do you go about addressing matters of science and faith? 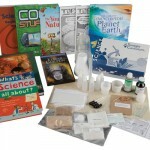 What might you want to see in upper level homeschool science curricula when it comes to these questions? Please let us know in the comments section! I don't know that I have enough information to be dogmatic for any perspective. I was raised on a steady diet of young-earth creationism. I still believe that God is capable of creating the earth in seven literal 24-hour periods, but I no longer believe that geological evidence points to that as the likeliest explanation of how our world came to be in its present state. I guess I would probably put myself in the old-earth creationist camp. The subject of biological evolution is another matter entirely, and a theory I believe rests on much shakier ground. Exactly what I would have said. We teach our children from an earth-age neutral standpoint. I do not believe in evolution or the Big Bang theory. I believe the Bible. With God nothing is impossible. I would not purchase any books or support any organizations that teach the evolutionary theory as fact. I've been doing a lot of thinking about this issue lately. I am Christian and believe that God created the earth in a literal 7 days of 24 hours each. If you think about the great flood, and Noah, and all the pressure that much water would put on the earth's surface to compress it and cause erosion and shifting......I believe that is why geological dating is so varied. Even scientists and geologists can't agree on carbon dating, the age of the earth, ages of artifacts found and time periods. And I believe that the great flood is the reason why. I too once held to the YEC view. Based on my own research and education, however, I now view the overwhelming weight of scientific evidence pointing to evolution as the mechanism of intrascecial and interspecial change through adaptation. As a homeschooling parent and a recurring user of Sonlight materials, I would like to see more treatment of theistic evolution. That is what we teach to our children, but it has been difficult to do so within the context of otherwise Christian-based homeschool curricula. Hello, Robert! I think this was an excellent post. I believe what the Bible says. I usually literally interpret the Scriptures. But I don't find it threatening to state that scientific evidence indicates this or that. What I find threatening are "scientists" who ridicule anyone who could possibly believe the Scriptures. I also find the dogmatic side of some of the young-earth creationist curriculum providers a bit disconcerting. Whenever we speak the truth as we understand it, we should try to have a healthy respect for opinions that are not the same as ours. I'm an old earth creationist, however homeschoolers have the unique opportunity to expose their children to all different frames of thought. I feel that this aids them in their own reasoning skills, and gives them a much stronger hold on what they believe. My children have come to agree with my views, not because they were force-fed, or knew nothing else, but because of the deep conversations that took place around all the information they had access to. I would hesitate to say that Christians 'embrace' evolution. The desire for textbooks with evolutionary teaching is probably more a result of Christians wanting to present a balanced viewpoint to their children. 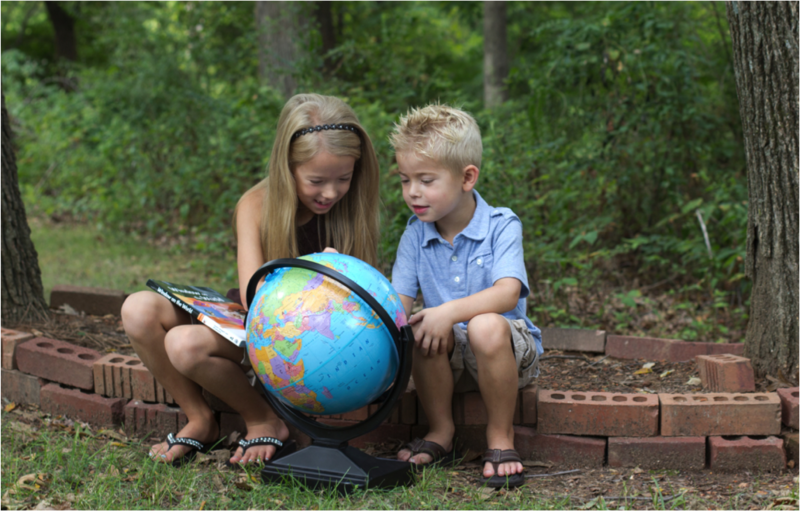 While we hold strongly to the young-earth worldview, I realize the importance of exposing my children to all viewpoints, whether we agree with them or not. I would guess that we're not the only family who feels this way. We start with Scripture first. Then, when differing viewpoints challenge ours, we have aplumbline to measure against. Our goal is to teach our children to reason things out for themselves. As a result, they can have a steadfast faith that they truly take ownership of. We embrace theistic evolution and mainstream science - we teach that science and religion are compatible. I would like to see this reflected more in homeschool curriculums. I am somewhat offended when curriculum companies use the phrase "christian worldview", or "science from a christian perspective" to mean young-earth creationism. A lot of worldview curriculums are do that too. It feels as if they are saying you have to believe this particular way to be a real christian. 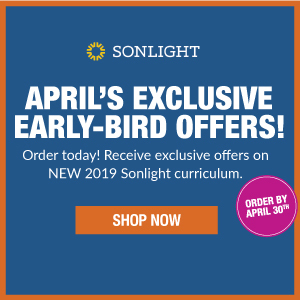 I do believe Sonlight does a great job of allowing us as parents the ability to bring up the topic of evolution and discuss our viewpoints with our children. In response to one comment above, I would like to note that evolution and adaptation are completely different issues. In evolution, one species turns into another; in adaptation, a species is changing characteristics as influenced by time and environment. A great source I would like to suggest to other parents is the Jonathan Park radio drama series, offered through Vision Forum ministries. These are very enjoyable to listen to with my children and are chalk full of helpful explanations to help understand the science behind a creationist viewpoint. Thank you. I could not teach science to my children that teaches creationism only. My children will be going to college and need to understand evolution. To be taught creationism also is fine, but evolution is mandatory, at least for my children. Sounds like I differ from most. As a child in public schools, I was taught evolution, with no room for God, but at home my parents talked with me about creationism. I believe that the young earth view makes the most biblical sense. God using the deaths of many generations of animals in order to create seems out of line with his character, and I believe that we should take Genesis literally, where ever that seems like the simplest explanation. God is certainly capable of creating in any amount of time he desires to. My kids are still preschool aged, but I plan on teaching them what I believe, while also explaining that we don't yet have all the information, so I could be wrong. The most important thing is knowing that it was God who created us, which gives us purpose and value. As we continue to learn about the earth, I believe in time we will have a clearer picture of the earth's past, even as we have come to understand other areas of science. As Christians, I believe we should unite on the important issues (in the beginning, God created...), and keep open discussion going about those things that we don't agree on. Thank you, everyone, for all your insightful comments. It's helpful to hear a variety of perspectives. Despite some of the differences on these points, we should remember our areas of unity, such as belief in the God who created the universe, who is actively involved in creation, and who cares a great deal about each one of us. Above all, regardless of our position on these matters, we should strive to interact respectfully and charitably. Thank you for your posting. I appreciate an open forum on this topic. So often I see fear and fundamentalism ruling the conversations. I happen to believe that the way God reveals truth is through scripture and His creation - we look to both to understand who He is, how He loves us and how He made this universe. My look at scripture and science has led me to maintain an old-earth creation stance. Each believer should do his/her own looking and praying - and encourage our children to look at all evidence. Look at science - lots of science, not just the science articles written by your favorite authors. Read arguments from all perspectives - and always look at the whole of scripture. May the Lord bless you as you teach your children to be good thinkers. The Atlantic article has it right. Thank you for asking our opinions and opening a dialogue. Thank you so much for this blog post! I am definitely Old Earth and often ponder the possibilities of certain parts of Evolutionary Creationism and how they could fit with scripture. (Because I hold to the authority of scripture, in harmony with the record of nature which was also authored by God :)). When teaching my own young children, I tell them what I believe and why, and teach them to be gracious and respectful to their friends who " believe that there were dinosaurs on Noah's Ark". For my science students (homeschooled high schoolers) I "teach the controversy". We use Apologia (YEC) but I try to graciously bring in what the OEC and/or TE viewpoint would believe when appropriate. My hope is that we can graciously dialogue and that each side would accurately understand what the other viewpoints believe, even if they disagree. I love your comment "Despite some of the differences on these points, we should remember our areas of unity, such as belief in the God who created the universe, who is actively involved in creation, and who cares a great deal about each one of us. Above all, regardless of our position on these matters, we should strive to interact respectfully and charitably." Yes...this should be the central goal. Sonlight's stance on educating and not indoctrinating is one of the main reasons (among many others) that I have 4 cores worth of SL books on my shelf and hope to have many more! So glad you brought this up! I would love to see Christian curriculum that shows YEC and OEC so I can help my kids see that however it happened, God did it, and that sometimes people (even Christians) don't agree and that's ok. I'm sure some parents disagree with me about not teaching one or the other but I think it's ok to say "I don't know how it happened, this is what the people who study it for a living have found, won't it be cool when we get to heaven and we can ask God *exactly* what happened?" More important to me is to say that even though I don't know how I do know the why. So what if creation science doesn’t follow the scientific method? Why not teach both? Teach the controversy, as they say? Proponents of creation science and intelligent design insist that schools and colleges should introduce these ideas into their curriculum under the guise of “critical thinking”. Real science is critical thinking. The entire basis for the scientific method is critical thinking — questioning assumptions and testing assertions. Creation science and intelligent design are not critical thinking. They are based on faith. They presume a truth from the beginning and refuse to question it. If the truth is “Jesus provides the redemption from mankind’s sinful nature,” I can agree with them. There are other truths revealed in the Bible on which I am sure we can also agree. However, if their so-called truths also include “the Earth is 6000 years old” or “All of the stars and galaxies were created in a literal 24-hour day” or “God did not use biological evolution to achieve the diversity of life on Earth,” I have a problem with this being taught under the guise of “critical thinking.” In each case they have presumed an incorrect truth and then try to apply scientific principles to back it up. This is not science by any definition of the word. By applying the scientific method and using logic and evidence-based reasoning, we know with a great degree of certainty that the Earth is billions of years old, that stars and galaxies form over millions of years via the gravitational interaction of gas and dust, and that humans and other life forms on Earth share a common ancestry that goes back hundreds of millions of years. Creation scientists and ID proponents accuse scientists of making assumptions as well. What they fail to state is that these assumptions are based upon prior demonstrated theories such as the theories of gravity, molecular physics and nuclear physics. There is a long chain of supporting evidence that in the end, rests entirely on basic facts, logic, and mathematics. Scientists will always debate the minutiae of any theory. However, there are no assumptions in the core concepts of the modern theories of star formation and biological evolution that aren’t backed by a strong chain of evidence-based reasoning. Creation science proponents wish to remove reason and objective logic (both deductive and inductive) as cornerstones of the scientific method and replace them with a “solid” foundation of opinion-based Biblical interpretation and presuppositional logic. Intelligent design proponents have a similar goal but they don’t even agree among themselves on basic theologic concepts. In situations where the opinions vary wildly, presuppositional logic will yield wildly differing answers. Both the creation science and intelligent design camps are advocating relativism over absolute truth when it comes to determining how the natural world operates. If we're going to teach them science, just teach them the real thing. Thank you for addressing this important issue! Reading through the comments, one thing I noticed a few times was the term "real science." It was used to describe the evolutionary position, as is the norm in the mainstream. To borrow from Jude above me, "If we are going to teach them science, just teach them the real thing." The very accusation pitted against Creationists - "they only teach their perspective"- is the exact issue I have with Evolutionists. Only evolution is "the real thing." Offering children in conventional schools anything that threatens that "real thing," such as "Intelligent Design," is fought tooth and nail. I believe in viewing the world through the lens of Scripture, not viewing Scripture through the lens of the world. By so doing, I am not afraid to study all views and expose them to my children. I WANT it all on the table because all Truth is God's Truth. He has promised to give me the Spirit Of Truth to guide me and Perfect Love to cast out all fear - that includes the fear of deception. This should enable me to step out of the queue any time He reveals a lie. I wasn't back there to apply the scientific method, but the Spirit of Truth WAS. That keeps me humbly confident! He came to us through the Virgin Birth, turned water into wine, and rose from the dead. And yet He came looking every bit the average man. Everything about Him is supernatural - so much more than meets the human eye. Why should Creation or the Flood details be anything less incredible? I'm looking for a homeschool science curriculum that doesn't have snarky comments about, "People who want to believe that the earth is billions of years old." I question the Young Earth Creation point of view, because (1) I don't think it's Biblically necessary, (2) I think it's an obstacle to faith for many unbelievers and (3) it's an obstacle to growth for many believers. The YEC construction posits, "If you don't believe the earth is young, then you're saying that the Bible isn't true in what it says about creation…so then how do you know that it's true in what it says about Jesus?" This makes YECism the litmus test for authentic Christianity. And then YECers wonder why young people go to college, learn a little bit of science and walk away from their faith…when they are the ones who taught those young people they had to choose between modern science and faith! Thank you for your open mindedness or ability to consider beyond charismatic ridged walls. . 2 Peter 8. “But do not forget this one thing, dear friends: With the Lord a day is like a thousand years, and a thousand years are like a day.” Think like a 5 minute time out for a young child seems like a day. For a parent might seem like a second. God is speaking to us in Peter. This statement of Time is to encourage us to trust not put God in a box nor on a clock. Gods ways are beyond our finite minds. I’d hate to think God would create us yet we have nothing to wonder about, to be curious about to be compelled to aim to discover. My God is so mighty he can take a moment a blink that can spark all creation. In his eyes it makes beyond sense that he knows every step , every building block, moment where each piece of dust, each molecule, each movement or action that causes an equal or opposite reaction, that creates action or a potential of sorts for Gods initial design. Who are we to say no these are not the building blocks God may use. Even though God created us to think to dream to discover to be in awe. I’m thrilled to find a homeschooling program that supports teaches truth thought of God creation and science. Think of impossible builds today from Dubai to Miami. Should we ignore the build creation process and just accept what we can see, explain with our finite understanding at the time. Or do we ponder w wonder curiosity of not understanding and ask questions seek to attempt to begin to conceive fathom accept trust a bit of the process yet not all fully understand yet know it’s possible and to just be in awed. I hate to think of “Christians putting themselves in a mental midget box” God is so awesome take our creator of all out of a box. Trust how he made us in his image. Very interesting article on something I feel very strongly about! 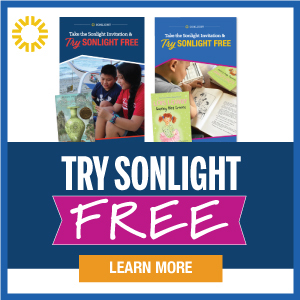 My wife and I are homeschoolers who have used Sonlight literature materials in the past. After years of study I am convinced that far from conflicting, science and religion are in fact saying the same thing, but in different 'tongues' (the subject of my latest book, "A 'Final Theory' of God"). The Book of Genesis confirms the discoveries of modern science regarding the origins of the Universe. I feel that these discoveries are not only compatible with our beliefs, but that they confirm the existence of God as the Supreme Lawmaker! My problem with young earth creationism isn't as much a scientific one as much as a theological issue. John Walton's (an evangelical OT scholar at Wheaton College) Lost World of Genesis One is a helpful reference. When we say, "I just believe the Bible!" are we asking the interpretive questions such as the genre being used to communicate truth or the historical context? Or are we reading OUR contemporary issues into the text and imposing our ethnocentric assumptions onto the Bible? In doing so, we simultaneously make the Bible to say so much less than the revolutionary worldview it was/is communicating and we risk intellectual dishonesty for the sake of sacrificing scientific inquiry. Many of us are forced to either choose between a young earth apologetic as science or equip our kids to cling to a theistic worldview in a naturalist/materialist context. This false dichotomy will force the church to lose a generation of our kids. I Have a BS in Geology, I would like to see more theistic evolution/adaptation. I am an old earth believer and that God created all, no matter how long it took. None of us really know as we were not present at the formation of our Earth or universe. I think science is not exact and the discovery/processes that we do to determine theories is what the scientific process is all about. Science and religion/faith can go hand in hand, but it is unfortunate that many people think otherwise. Science is about discovery and searching for answers to explain the unknown. See my earlier reply. I agree support your comment. Who are we to put God in our human finite box of understanding...I’m excited thrilled to find a possible home school plan that teaches modern science yet w faith. Heck it takes requires faith to accept science as one defines it. To trust. Again God created us w minds to seek. Side note. History classes in Texas today are so inaccurate. I was taught to seek truth growing up. Yes kids have to get the info right for tests. I’m worn out that our schools teach half or part truths out of fear and politics. That’s a whole other issue. Kids should not feel bad about who they are due to half garbage teachings to instill ideas of self. Again another issue. The world has been corrupt wrong cruel evil toward each nation creed and color. Not just one against one. Let’s start from the beginning and let’s get real about our past leaders ect from all parts of the world. I would like to see faith based curriculum that embraces modern science. It frustrates me the fear level in Christianity when it comes to looking at evidence for evolution, for example. We teach our children that God gave us smart minds and reasoning powers for a reason and that we don't need to be afraid that evidence we find is going to disprove Him or His existence. If God really is the living creator we believe Him to be than He is well able to hold His own and does not need us to keep propping up, defending, and taping together a viewpoint that doesn't hold water with logical findings. We don't believe the heavens are made if brass, or that actual pillars are holding up the sky, because of the evidence we have seen, even though biblically these are described. We teach our children to recognize that God used poetry, story, metaphor in the scriptures to inspire our minds and help us see spiritual thoughts and ideas but never intended us to ignore actual evidence and fact. It does not subtract from Him for us to look at and examine evidence, it can only add to Him. He never has been housed in religion. All of His creations proclaim Him. He says man would have no excuse in not recognizing His existence because of the evidence in His creation. He was not afraid of the evidence we would find in nature and pointed it out to us as unrefutable in His favor. And He knew there would be a time when we would break DNA's code and study quantum physics. Let's not be afraid to see it as it is, recognizing that we still are barely scratching the surface of understanding the complexity of it all. We tend to believe God used evolution as a tool in creating. Not just because of scientific evidence, but because of human evidence too, watching how God builds us spiritually as people. Yes there are times of great leaps forward, but there is a lot of slow, deep, tiny step by tiny step work that goes on in our hearts. Evolution seems to fall in great with the nature of God as I have seen Him at work. Even a human embryo looks like a fish, like a lizard, etc. as it forms showing an evolution of sorts. So many things bear that fingerprint. And I think it's wise to look at the fingerprints He leaves behind. Surely His creation feels like Him. Just like you can recognize the signature styles among human artists. I'd love to see curriculums put out that recognize these sorts of ideas and set aside the fear that somehow in our looking at the big picture we might lose the God we love. I remember growing up in a young creation mindset and never watching a Nova documentary about anything relating without verbally refuting the things I heard regarding timeframes, and evolutionary evidence. That's no way to think! The mode taught seemed to be "ignore the evidence it's wrong because it's not what Genesis says". God didn't make us to think that way. If we have to prop up our God and ignore truths to keep Him intact that only speaks to me that we might be following a God we made up. Let's teach our children to look for the One who is alive, incredibly creative, the One who dreamed it all up and wants an amazing relationship with them. Have you found such a curriculum? I am trying to find something for 7th and 8th grade science but so far have been disappointed in that only young earth creationism is taught but that there are aggressive and rude attacks on evolution and old earth science. I am shocked. In this current culture of hate, I would rather find something that teaches, not passes judgement on other views. Wow Beth. I’m 100% supportive in agreement in your statements. Amen. I say who are we to put our God in our finite human mental box. Thank you so much for your statement. The comment fear level in Christianity is so accurate in my findings. Your desire to see curriculum designed w well my paraphrasing, with Gods love awesomeness and all he gave us to explore discover be in awe of to seek info from and of. You are much more eloquent than I. Thank you. Perfectly stated.